Though spending time in the garden is a rewarding pastime, not everyone has as much time as they'd like to tend to picky or difficult flowers. Luckily, there are many flowering plants that are easy to maintain and will produce vibrant flowers even with minimal care and attention. Easy to grow and largely pest-free, marigolds (Tagetes spp.) are flowering members of the daisy family native to Mexico and Central America. Marigolds are prized for their fluffy blooms, which are available in colors ranging from yellow to deep orange red. The plant is adaptable to most soil types, so long as the soil is well-drained. 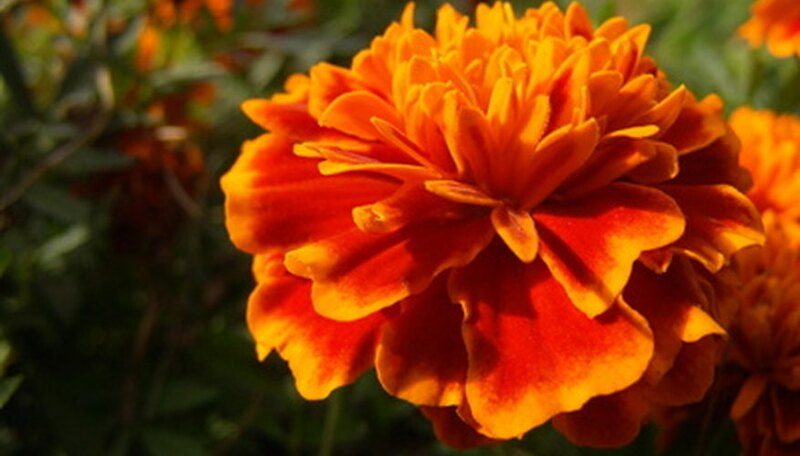 Marigolds grow best in full sunlight, and they should be watered during droughts or hot summers. A native of the American Midwest, pink evening primrose (Oenothera speciosa) is no stranger to sunshine. The plant is notable for its floppy, pinkish blooms and its bushy mid-green foliage. Tolerant of high humidity and drought, pink evening primrose thrives in full sunlight. Planted in well-drained soil, this trailing plant requires almost no maintenance. The plant is best utilized when allowed to spread out, creating a naturalized appearance. Pink evening primrose is a great way to bring wildlife to a garden, attracting birds, bees and butterflies. A native of Mexico, rat tail cactus (Aporocactus flagelliformis) is a flowering cactus that is often used in hanging baskets or containers. The plant has long stems and tubular, bright pink blooms. The low-maintenance plant should be placed in sunlight coming from the east or west. Plant rat tail cactus in either a general purpose cactus potting soil mix, or in rocky, well-drained soil. Keep soil moist, and apply a water-soluble fertilizer once a year during the growing season. A native of Brazil, princess flower (Tibouchina urvilleana) is a flowering evergreen shrub that produces silky purple blooms atop long, gray green leaves. The summer blooming plant rarely has pest or disease problems, and can mostly be left alone once established. Plant princess flower in rich, fertile soils in full sunlight, or partial sun if growing in a hot climate. Water the plant enough to keep the soil consistently moist, but not soggy. A dose of fertilizer after each flush of flowers will help keep the princess flower in bloom. The flowers of the plant can be cut and used as accents in a wildflower bouquet.